We are hopping with a special guest - The amazingly creative Paula Dobson. 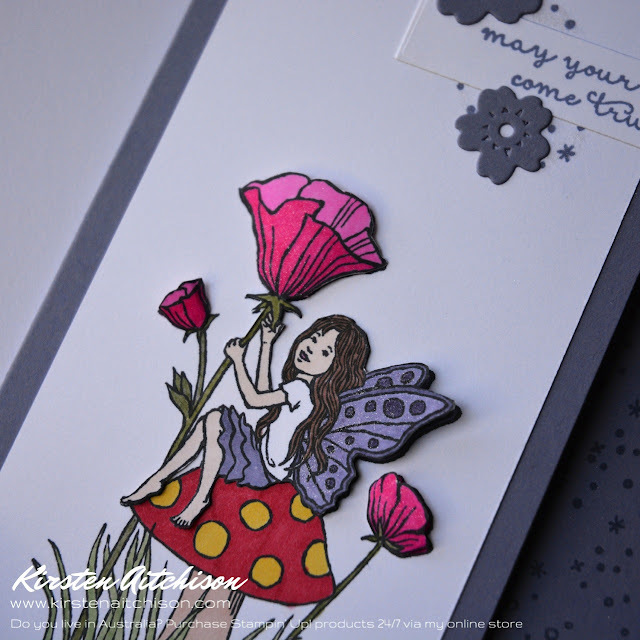 The theme of this blog hop was to CASE (Copy And Selectively Edit) one of Paula's cards. To checkout Paula's card in more detail click here. I really liked how the flowers appear to jump off the card as well as the subtle stamping on the edge of the card. 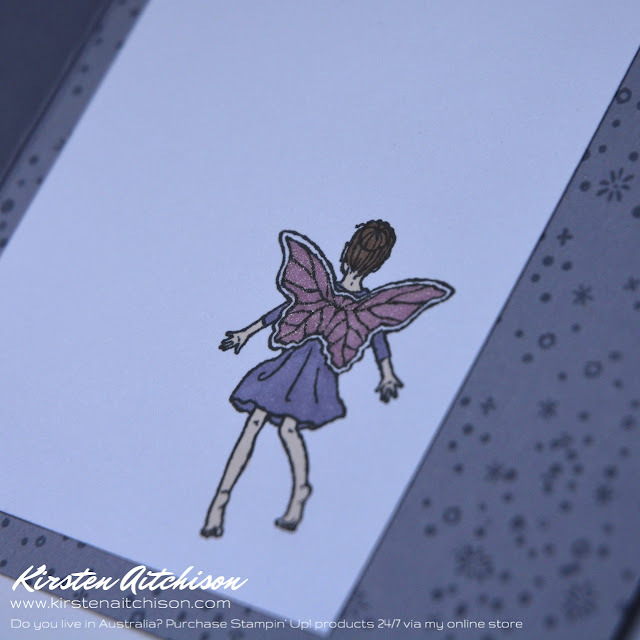 To create this card I stamped the lovely fairy images from the Fairy Celebration set onto Whisper White cardstock using Memento black ink. I stamped the fairy sitting on the mushroom image twice. I then coloured my images with alcohol markers, I used my retired Blendabilities. 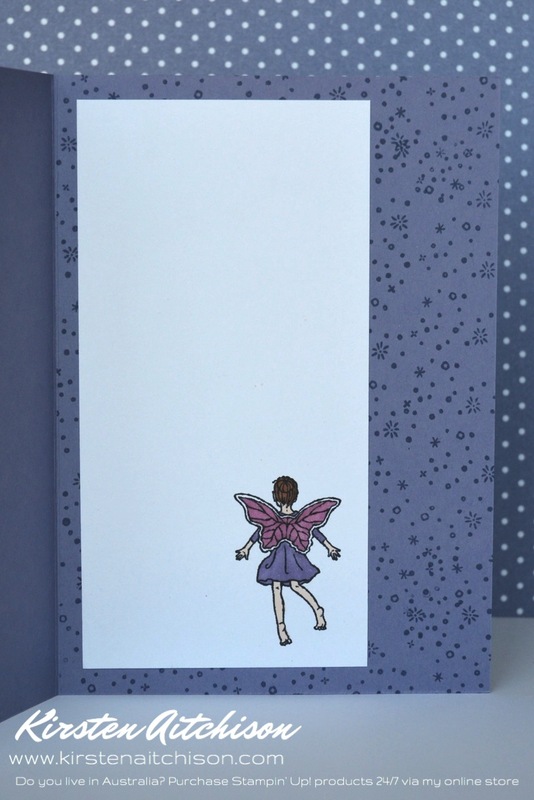 After colouring, to achieve the jumping off the card look, I fussy cut the flower heads and the fairy on my duplicated image. 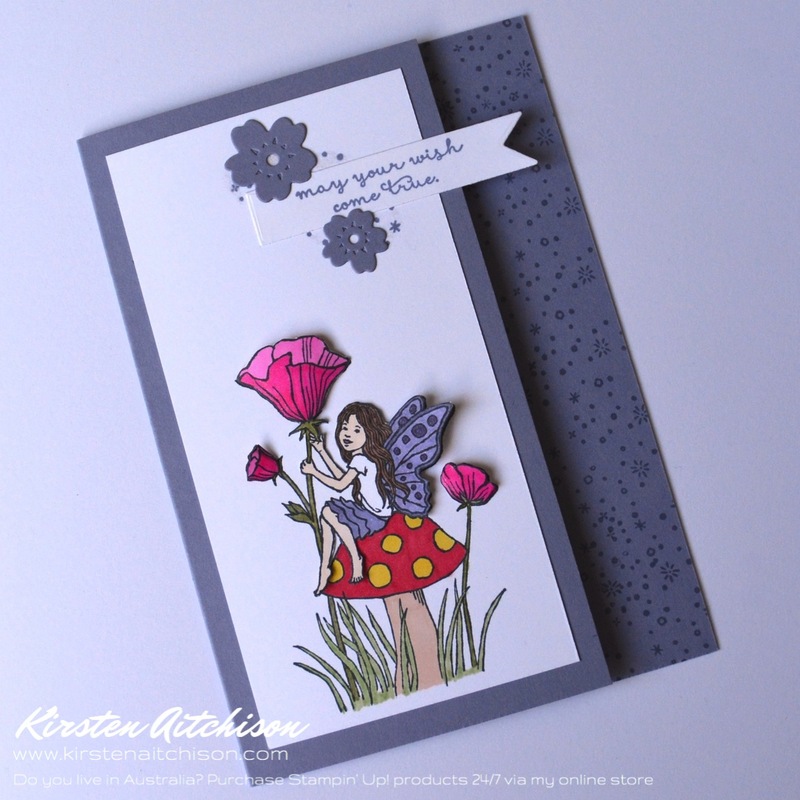 I rounded the edges of these fussy cut pieces to give a 3D look and then attached the pieces with Snail adhesive under the fairy and small pieces of dimensionals under each flower head and the fairy wings. The fairies legs are just dangling. Using the sparkle stamp in this set, I covered the inside of the card by stamping the image in Wisteria Wonder ink on my Wisteria Wonder cardstock and then adhered my card liner with the fairy at the bottom with some Snail adhesive. I stamped the same sparkle image a couple of times at the top of my card front, and then placed my sentiment over the top. The sentiment (also from the Fairy Celebration set) is stamped in Wisteria Wonder and then cut using the banner from the Gift Card Envelope & Trims thinlits which I shortened and hung over the stepped edge of my card front. I recently purchased the clear Wink of Stella glitter brush and it arrived just as I finished my card. So I decided to add some subtle sparkle using my Wink of Stella. I learnt the hard way, that you don't try out something you've never used before on a completed project, you should always test it somewhere else first until you have worked out how to use it. I thought there wasn't a lot of glitter on the brush tip, but it was more than I thought and of course I used it first on my stamped sparkles around my sentiment on the front of my card. I ended up with a bit too much glitter and it wasn't the wink of glitter I was hoping for, so I decided to cover up my mishap with a few flowers I cut out using the Bloomin' Hearts thinlits. I think they ended up looking like they belonged there. After my Wink of Stella mishap, there was the perfect amount of glitter on my brush tip to add just a wink of sparkle to each of my flowers and the fairy wings on the front and inside the card. I really love the very subtle sparkle that the Wink of Stella glitter brush quickly and cleanly provides. And now I know how to use it, I think I'll be using this quite a bit now. I've taken close up photos of the sparkled images so you can see how pretty and subtle it is. 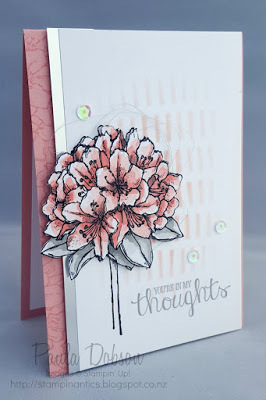 I have also included my card in this weeks Crazy Crafters Team Project Highlight. Skin Tone Assortment (Bronze, Natural & Ivory), Wild Wasabi & Wisteria Wonder. I just love this stamp set. I like the way you stamp sparkles inside of your card. Good case! Oh so pretty and then the lovely little surprise inside the card too! You chose some beautiful colours Kirsten.....I love how the flower just pops off the page. So pretty! What a sweet card. This is so pretty. I love the decoupage feel about it. Super cute .. thanks for sharing! 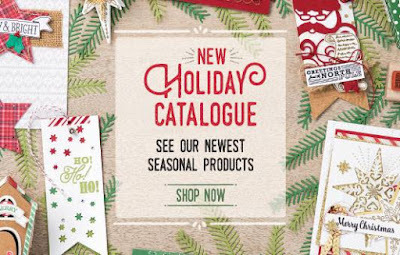 This is very pretty - I have a couple of great nieces who would love this! I love this card Kirsten! 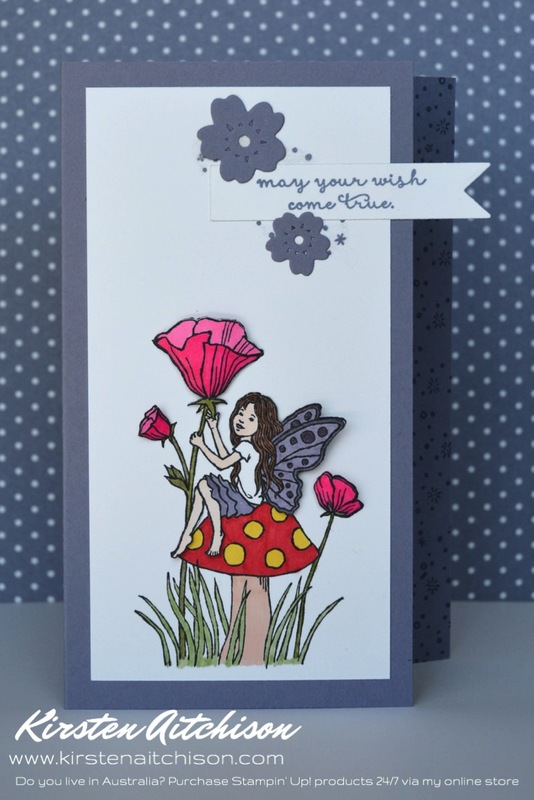 Fairy Celebration is my favourite stamp set at the moment, and I love how you used the Wink of Stella. So pretty, love the delicate stamping on the inside layer, just gorgeous - any girl would be so happy to receive this! This is a really cute card Kirsten. Well cased!